Scores 21 Highway MPG and 17 City MPG! Carfax One-Owner Vehicle. This Jeep Wrangler boasts a Regular Unleaded V-6 3.6 L/220 engine powering this Automatic transmission. Part-Time Four-Wheel Drive, WHEELS: 17" X 7.5" ALUMINUM, TRANSMISSION: 5-SPEED AUTOMATIC (W5A580) -inc: Hill Descent Control, Tip Start. QUICK ORDER PACKAGE 24S -inc: Engine: 3.6L V6 24V VVT, Transmission: 5-Speed Automatic (W5A580), Air Conditioning, Leather Wrapped Steering Wheel, Chrome/Leather Wrapped Shift Knob, Tires: P255/75R17 OWL On/Off Road, Wheels: 17" x 7.5" Aluminum , TIRES: P255/75R17 OWL ON/OFF ROAD, SUPPLEMENTAL FRONT SEAT SIDE AIR BAGS, SIRIUS SATELLITE RADIO -inc: 1-Yr SIRIUSXM Radio Service, For More Info Call 888-539-7474, MANUFACTURER'S STATEMENT OF ORIGIN, FIRECRACKER RED CLEARCOAT, ENGINE: 3.6L V6 24V VVT (STD), BLACK, CLOTH SEATS W/ADJUSTABLE HEAD RESTRAINTS, AIR CONDITIONING, 3.21 REAR AXLE RATIO (STD). 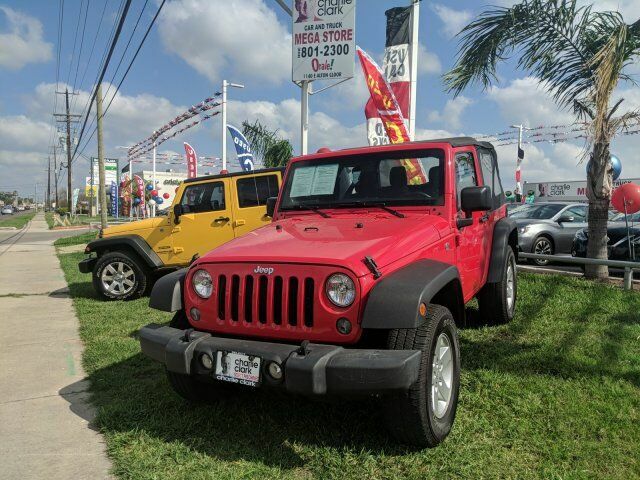 A short visit to Charlie Clark Nissan Brownsville located at 2547 North Expressway 77/83, Brownsville, TX 78520 can get you a tried-and-true Wrangler today!